If you open multiple websites in the Firefox web browser — and most Firefox users probably do — you may run into situations where Firefox slows down at one point or the other. Firefox handles semi-large numbers of tabs quite well, both when it comes to memory use and CPU utilization, but there is still the chance that a site, or a browser extension, may slow down the browser. While that is sometimes easy to find out, for instance when you just opened a site and the browser starts to hang or slow down, it may not be as easy at other times. Mozilla Firefox comes with internal tools that help you analyze the situation and find out which tab or extension slows down the browser. 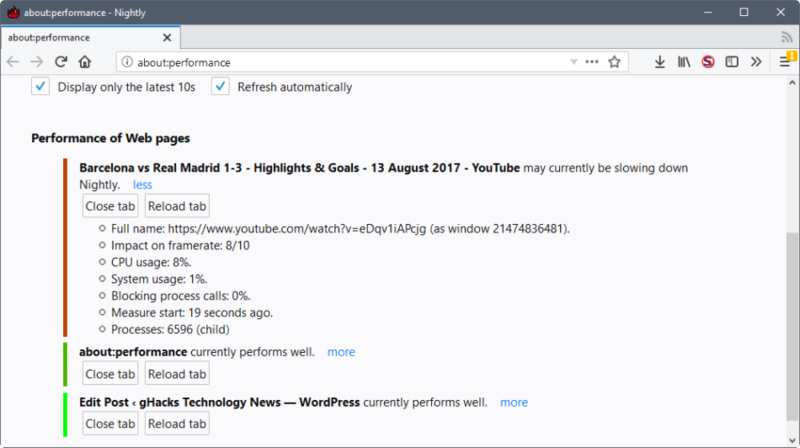 Mozilla added the about:performance page back in 2015 to the Firefox web browser. The organization improved the page several times since then, for instance by redesigning it to improve the information, or by adding process information to it. Note that the following method works only if Firefox is still responsive as you need to load the internal URL in the browser to access the information. 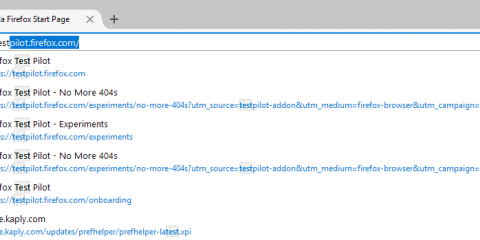 Load about:performance in the browser’s address bar to get started. Firefox separates the data in two sections: memory usage of processes, and performance of web pages. The first section displays the memory usage of the core Firefox process and all subprocesses. Firefox is a multi-process browser, and the number of processes you see on the page is related directly to the number of content processes the browser uses, and the number of webpages that are open. You cannot link a process to a particular website in Firefox. This is different from how Google Chrome displays information in the browser’s task manager as it highlights websites directly in it. The “performance of web pages” section however highlights open sites and how they perform. Mozilla Firefox grades these sites automatically in three ways. First, by listing the highest offenders at the top of the listing. Second, by using color codes that indicate the performance. Light green is good, red is bad, and there are nuances in between. Third, through text. 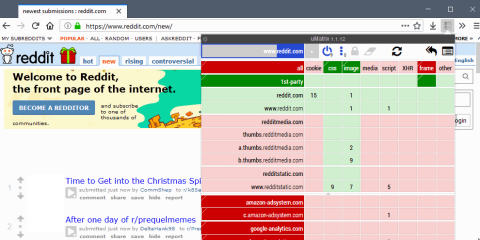 Firefox displays either “currently performs well” or “may currently be slowing down” information next to each tab. You may click on the more link next to each web page listing to display detailed information on the performance. 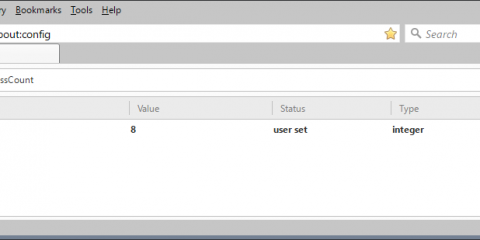 It highlights the cpu usage, impact on framework, blocking process calls, and the process ID. Buttons are provided to close or reload the tab right on the page. Note that Firefox displays only some open sites by default. You need to click on the “show all” button to display all open web pages in the browser. Once you have identified the offending page that is slowing Firefox down, you may close or reload it, or use the process information to kill its task. This is not recommended usually as you may kill multiple open sites this way (as sites may use the same process in Firefox as it is not a one-process per site or tab browser like Chrome). If you cannot control Firefox anymore because the browser appears to be frozen solid, you may kill its main process to restart it. 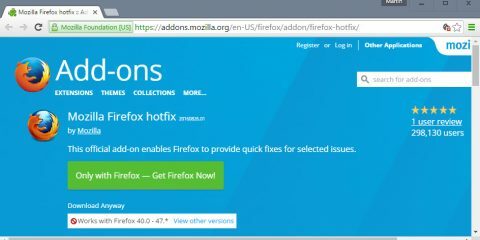 Firefox’s session restore feature should kick in at the next start of the browser. If you still have some control, you may hit Shift-F2, type restart, and hit the Enter-key. Now You: What do you do when you run into performance issues? The post Find out which sites are slowing Firefox down appeared first on gHacks Technology News. &nbsp;What Is Vegan Cheese Exactly&mdash;and Should You Be Eating It?